The other day, Dave Taylor was kind enough to allow me to Guest Post on his site and expand on some of my thoughts when it comes to charities and the hobby. If you haven't seen it, take a look at the post, Three reasons why charity work is important and even more so than that, what Dave is doing to lead the way in charity work on his blog. This is a follow up to that post. For those who live under a rock and have not yet seen the huge blogger project Heroes of Armageddon that is underway, let's start there first. You need to do two things immediately. 1. Contribute to the project. 2. Help get the word out. Now that you're back and you're ready to keep going, let's look at the small role I'll have in this project. Some of you may be wondering how someone like me gets a super cool job like this. In my case, blind luck. I like to think the guys were happy with my work in the Storm Wardens project last year and they figured they could convince me to do it again. So what is it that I'll be doing exactly? I have a very clear role this time. 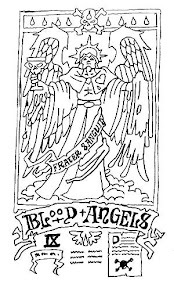 I will be assisting the Imperium and more specifically the Blood Angels team with their heraldry. All that is fancy for "I'll be making some killer looking banners." One will be the Blood Angels Armageddon banner that will be carried by a highly decorated Standard Bearer clad in ancient terminator armour. The other is a smaller, more personal banner for none other than Dante himself. That's a really good question. I haven't seen the terminator model that I'll be using yet so I'm not sure the amount of work that will need to go into him. The Blood Angels team leader was kind enough to provide me with some guidance which I promptly lost. 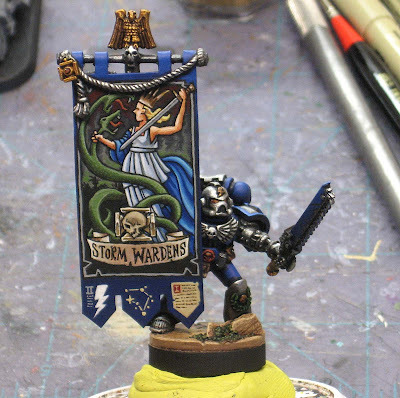 I do know the banner will be the same size or most likely slightly larger than your standard Space Marine chapter banner. It's got to be, these guys flew it during their time on Armageddon and it marks their participation in the campaign. Needless to say, I've got my work cut out for me. I do have a line drawing I did of the "regular" banner that I'll be able to modify for my purposes though so I'm not completely behind in my work. 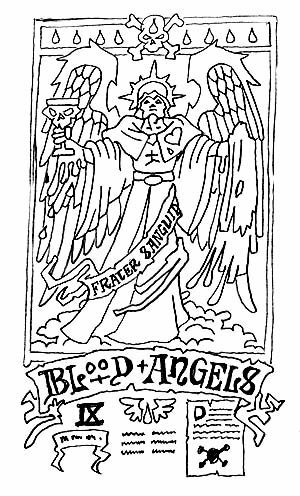 The image can be clicked on (for a larger sized one) and saved by you Blood Angel players if you want so that you have your own version you can print out, paint and use in your army. The other banner is Dante's personal banner. No pressure or anything. To be honest, I'm hoping this one comes to me in a dream soon. Otherwise I'm going to be in big trouble. So stayed tuned folks, I'll be posting my progress in the coming weeks. I've got to get my hands on some models, do some sketching and iron out my ideas. All that and then I can start painting. I'm hoping I can raise the bar a little bit this time around and really hit it out of the park with the chapter banner. Re inspiration for Dante's, when I think ultimate banner, I think of the Eternity Gate pic, here at the Lexicanum. Sure, piece of cake... you guys make it sound so easy. I think I'll cruise through the Codex to get a feel for this guy and see what kind of imagery comes to mind. I want it to "fit" with him and how people imagine him being. Maybe not the exact same imagery, but I want to try and capture the feeling. For Dante there are a couple things you wanna capture, he is incredibly old, highly honered by ALL the other chaptermasters, Calgar even chose Dante to run the Armageddon campaign above himself as their warmaster,Sanguinus MUST be featured in some way,and Baal should be featured as well, I'd try to keep it simple, but make it feel VERY old, a little antiquated, very well cared for, very well made, but stil try to incorporate all these ideas. That's all my mind can come up with. Also, depending on what pose the model is in when you get it, you may wanna do the banners in greenstuff rather than cardstock. Maybe ask Blood Saint from the Bolter & Chainsword or one of the other amazing artists within our online community for suggestions. I can't remember his name, but one of the BnC members did a stunning piece of artwork of Sanguinary as he held the gate on Terra. I found the thread with the artwork. It is by Colrouphobic. Although he uses a different medium I'm sure he, and other artists like Blood Saint, would be able to give some suggestions. Myles: Here you go: Contribute! Top of the right hand column of the page.